After spending three weeks working with this impressive array of FCP plug-ins, I'm convinced its name should be changed Boris Continuum "Wow." The collection provides in six categories over 150 filters, generators, and transitions. It is easily one of the most comprehensive packages of effects available for FCP users. The installer also supports After Effects, so you have de facto double bonus if you own Adobe's compositing application. At $795.00, it is a little pricey, but nevertheless provides unprecedented potential for creativity in postproduction. Many will remember Boris Yamnitsky as the individual who wrote the fx module for the early Media 100 systems. Today, Yamintsky's company consistently produces excellent, and exceedingly in depth, packages of generators, fx, titling, and transitions. Understandably some plug-ins are more impressive than others, but all offer the potential to add the special "touch" to video production. There are some very interesting new plug-ins and features. Cartooner transforms your source footage into an outline animation look. These outlines can be stroked, colorized, expanded or contracted to achieve the look you wish. A new Color Palette provides various controls for selecting and saving custom color swatches. The PixelChooser filter is both standalone and included as a parameter in many of the Continuum filters. BCC3 adds a Time Displacement effect, but in a unique configuration. It displaces pixels in time rather than is space. In addition, there is a new, and very useful, Motion Tracker plug-in. There is support for various film "treatments," and a new 24p conversion filter. BCC3 also provides a series of new parameters in existing plug-ins that now can be animated, such as apply modes. There are 3D compositing filters, filters used to create natural elements such as rain, snow etc., various particle systems and emitters, time manipulation and high impact effects. Boris has optimized BCC3 for whatever host application is being used. However, FCP does not support some parameters for certain effects, while After Effects will. The true impact of BCC3 is in the sheer breath and complexity of the supplied filters. There are literally endless combinations of presets and parameters to control virtually any aspect of the filter, transition, or generator. In this sense, BCC3 is both a novice and expert application. In the hands of the occasional users, for example, many of the default "looks" and presets will prove acceptable. There are numerous key enhancements to several filter groups. Perhaps most impressive is the "Integrated Motion Tracking" feature. The feature is a component of several filters, and eases the task of positioning the target point for the host filter on a moving image. You'll easily create a particle emanater that tracks a source point on a moving wand in your video. In addition, the new "Witness Protection" filter can similarly track the movement of a face to blur or obscure it using the integrated motion tracker. The particle effects feature provides both transitions and generators. It also adds a "Z" parameter using a 3D particle system that works on the alpha layer, and provides custom particle shapes, and cameras. Open GL accelerated lightning effects has been implemented as well. In FCP HD's Generator menu are thirteen real time generators used to create static backgrounds. 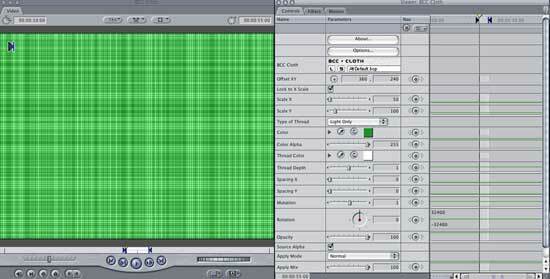 Although they do not animate, they do playback in real time, and include both default and option presets. Among the generators included are Brick, Cloth, Fractal Noise, Granite, Mixed Colors, Rays, Reptilian, Rock, Steel Plate, Veined Marble, and various wood textures. Combined with FCP HD's transfer modes, they create interesting effects. The BCC Caustic generator, although a slow render, is one of the best I've seen. It is used to simulate light refracting through a surface of water such as what you would see through the water to the pool bottom. 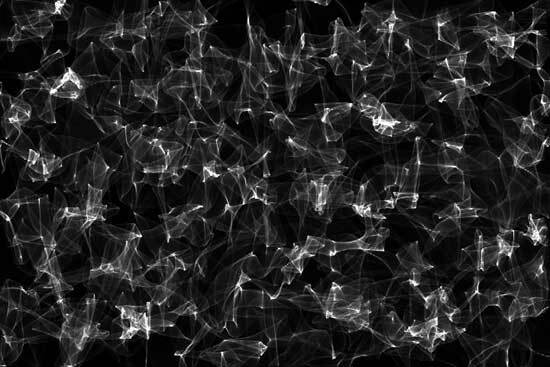 But it also can generate some pretty dramatic effects such as a plasma field or interesting geometric patterns. The package includes nine time-based filters to create smooth speed changes, and to blur frames across time. An interesting component of these filters uses displacement maps across time rather than in space. Using Boris's newly implemented Optical Flow technology, motion vectors analyze each image to create new intermediate frames for a smooth ramp. The seven wipe transitions include auto or manual animate selections, and a number of default and stock pre sets, as well as support for extensive border control. The deinterlace filter contains controls to deinterlace 60i footage and a reverse telecine generator that converts 29.97 video footage to 24P with pulldown. Rendering was fairly decent using a 2 GHz G5 with 2.5 Gbs of RAM. There are literally dozens of large and small enhancements to this package encompassing virtually any effect, transition, filter, or generator in 2D and 3D space. Within each of the applied plug-ins are both stock presets and dozens of sliders, drop menus, and additional controls to tweak the application of the plug-in. Previously unanimatable parameters now can be animated, and additional options have been provided to further animate the parameters. Many plug-ins, such as the Wipe Transitions noted above, have menu choices for auto or manual animate, as well as a percentage election. Registration of the product provides free technical support for a year, free software upgrades, and access to additional free filters. As I stated earlier, BCC3 ships with version 2's printed manual, but all new features are fully explained in the 3.0 PDF manual available on line or on the installer CD. On line Help files are also provided. Rather than providing more screen shots of various applied filters, visit Boris's website for some excellent still and video images. There is no possible manner to fully evaluate this package in any review. It is sufficient to represent that BCC3 represents one of the best values for plug-ins for FCP HD users, with the additional bonus of use in AE. Many users will simply resort to the dozens of pre sets available with the application of a plug-ins. But the product also carries with it the potential for virtually limitless augmenting of a preset or starting from scratch to create your. In this sense, patience and dedication are their own rewards, because virtually every plug-in is deep, complex, and powerful.